We were absolutely thrilled with the recent List Eating & Drinking Awards held on the 26th April! Centotre was HitListed as a highly-recommended Edinburgh breakfast destination – open from 7.30 daily (10am on Sundays), Live music venue – with our Jazzmain Trio joining us again this summer for sophisticated Sunday sessions! And, for our dedication to local produce, direct trade and seasonal Scottish ingredients! Well done to all the team and thanks again to all our customers, friends, suppliers and extended Love Happy Food family for your continued support! We are also excited to celebrate our sister venue, The Scottish Cafe & Restaurant’s, HitListing as a highly-recommended Arts Venue eatery! Well done to the TSC team and a big thanks to all our wonderful customers, friends and suppliers for your support – we certainly couldn’t do it without you! The Scottish Cafe was also highly-recommended for their top notch Breakfasts – open from 8am daily (10am on Sundays), their delicious coffee – served all day (with homemade cake if you fancy it) and the same dedicated philosophy of direct trade – sourcing fresh seasonal Scottish ingredients as locally as possible from a long list of artisan producers from all over Scotland. Open : Monday to Thursday – 7.30am until 10pm. Friday and Saturday – 7.30am until 11pm. Sundays – 10am until 8pm (extended in the Festival). 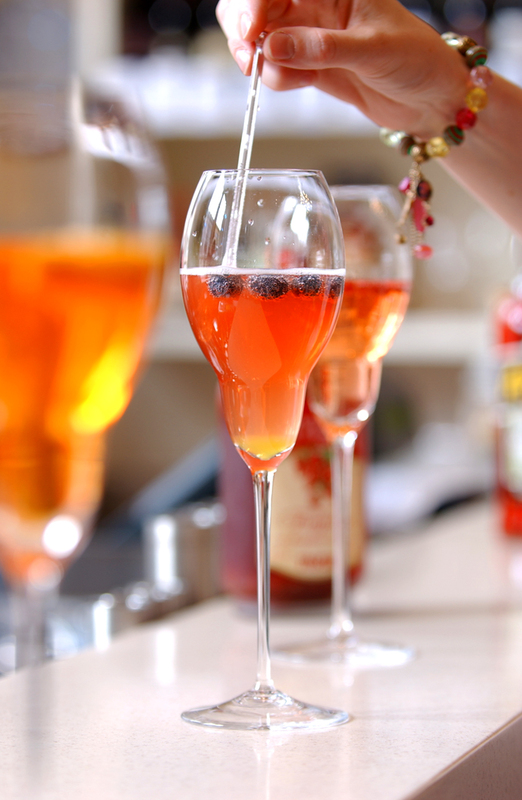 Bar open : Monday to Saturday – 7.30am until midnight. Sundays – 10am until 10pm. Like sister establishment The Scottish Cafe and Restaurant, Centotre promises to serve ‘happy food’, their term for food made with fresh, locally sourced ingredients. True to their word, Victor and Carina Contini work with a large band of Scottish businesses and an impressive list of suppliers can be found on their website. The interior of their George Street restaurant is also striking, a former bank with high, ornate ceilings, tall pillars and pristine white tables. Perhaps to cater for surrounding businesses Centotre opens nice and early at 7.30am for breakfast servings of pastries , rolls and even waffle dishes. 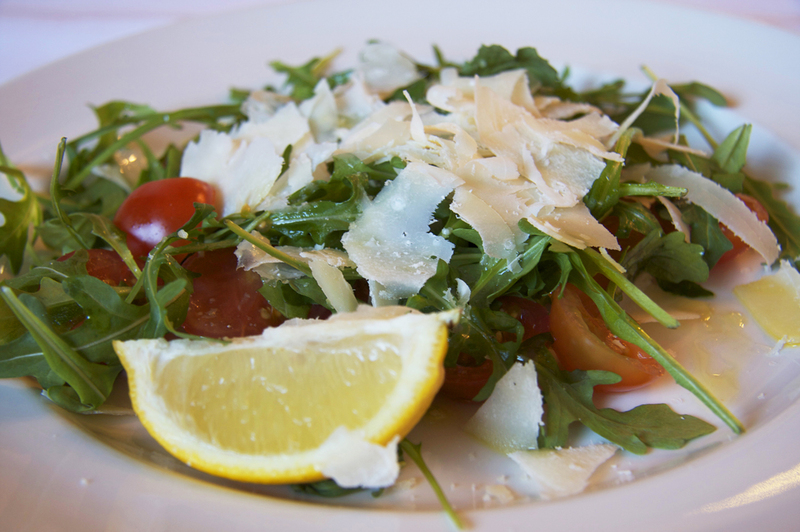 The evening a la carte menu features pastas, pizza, salads and main courses. A starter of silky gnocchi is surrounded by cream, sprigs of dill and smoked salmon. A main course of venison arrives with a tangy horseradish dressing and grilled vegetables. Desserts at Centotre are worth saving room for, particularly a delightfully crunchy meringue filled with berries and cream. 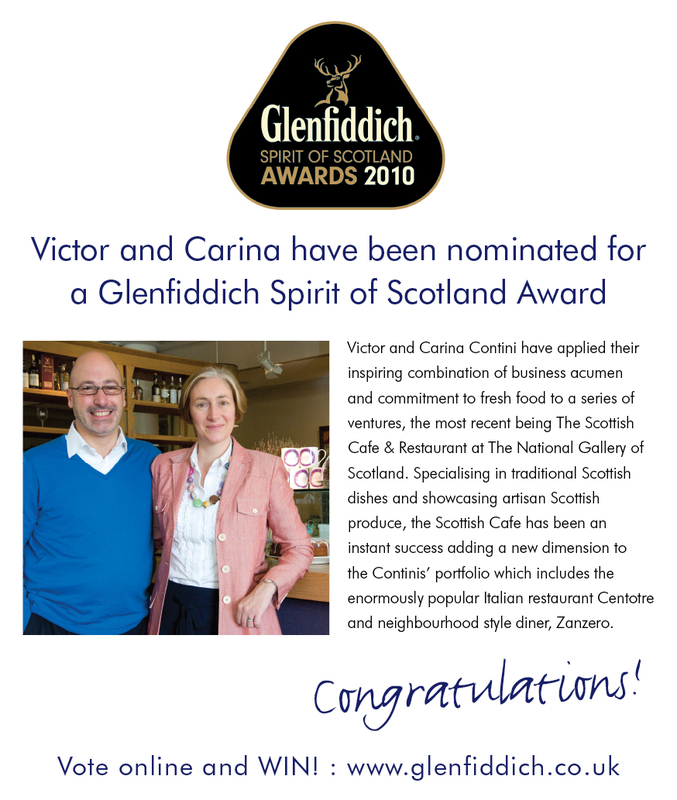 Victor and Carina have been nominated for a Glenfiddich Spirit of Scotland Food Award. You can vote online HERE and be in the draw to win some fantastic prizes! A luxury stay at the beautiful Meldrum House country hotel and golf club in scenic Oldmeldrum enjoying fabulous cuisine and relaxing in the hotel’s stunning contemporary rooms. An outdoor experience of your choice to try from a range of activities. 20 runners-up can raise a glass to mark this year’s Awards with a bottle of award-winning Glenfiddich Special Reserve 12 Year Old, the world’s favourite single malt.